Let’s build a 3-star or better world together! For the first time the United Nations has included road safety as a Sustainable Development Goal (3.6). 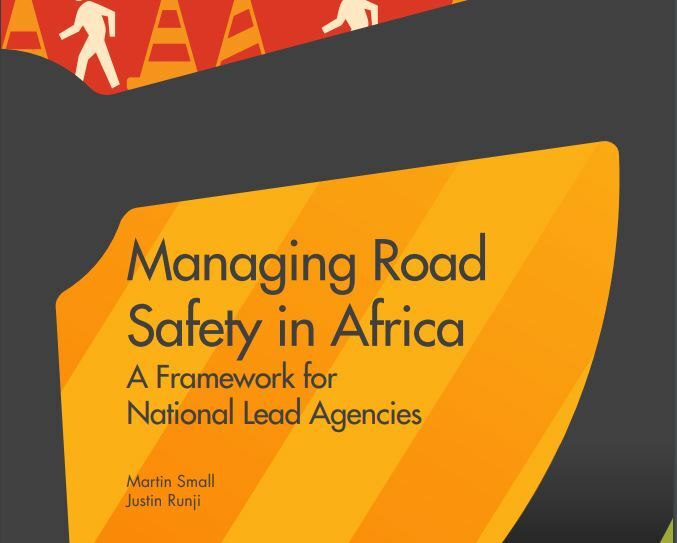 iRAP believes that improving the world’s roads to a 3-star or better standard is a key way to achieve the SDG target of halving road deaths and injuries by 2020.
a 3-star or better standard for all road users is helping to focus policy and investment. 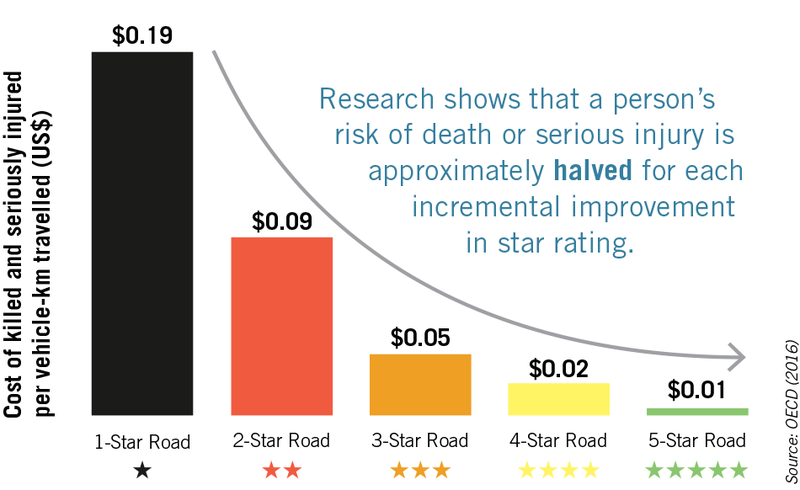 With crash costs typically halving with each incremental improvement in star rating the potential for 3-star or better roads to save lives is significant. The global 3-star or better campaign provides decision makers with the knowledge and investment business case to eliminate 1 and 2-star roads and save lives. The independent Fund for Global Health has established the Three Star Coalition to build a group of like-minded organisations advocating for the design and construction of safer roads in the developing world. Specifically they advocate for roads to be built to a minimum 3-star standard for all road users. 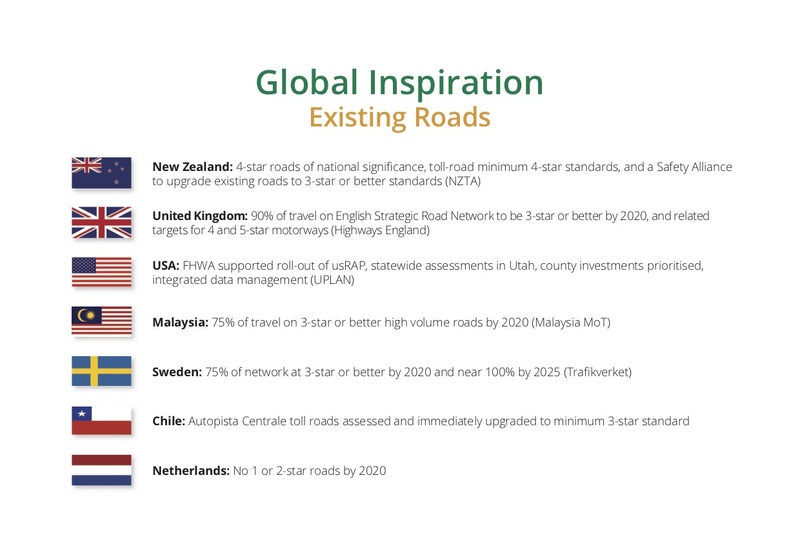 Many countries and project managers are now setting targets to increase the percentage of travel on 3-star or better roads and establishing 3, 4 or 5-star standards for new and upgraded roads. The star rating is providing a powerful metric to specify and track road safety performance at the network and project level, just as road authorities set targets for pavement roughness or other asset performance. These objective, evidence-based metrics provide simple, repeatable and realistic targets for countries and organisations to embrace. The UN Global Road Safety Performance Targets are now providing a common standard to benchmark the safety of the world’s roads. 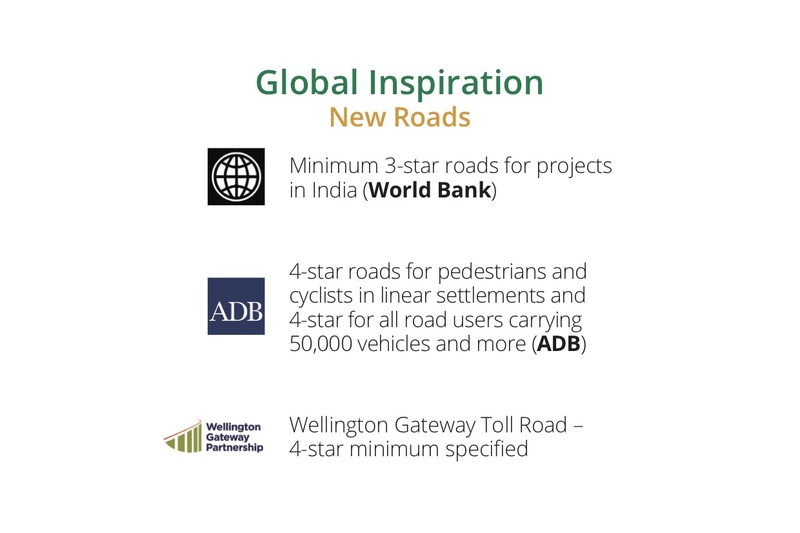 3-star or better roads for all road users is a key target for all of our partners to embrace as we work together to create a world free of high-risk roads. Ensuring more than 75% of travel is on 3-star or better roads for all road users by 2030 will save lives on a scale that matters. Star Rating and Investment Plan inspections create a rich source of data that provides an insight into why road trauma remains one of the world’s leading public health challenges. 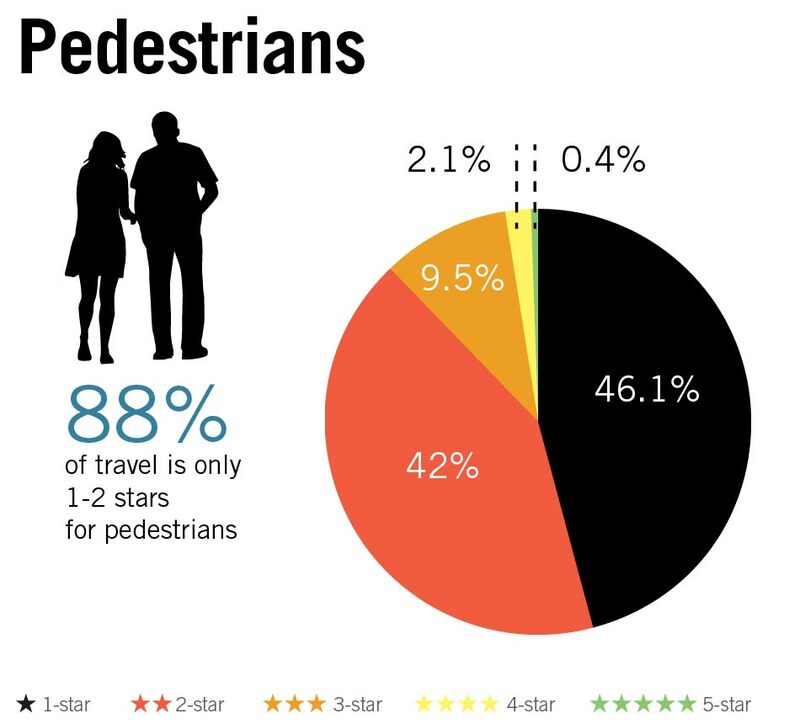 Based on evidence-based research, Star Ratings for pedestrians, cyclists, motorcyclists and vehicle occupants provide an objective measure of the likelihood of a crash occurring and its severity. 1-star is the least safe and 5-star is the safest. Why 3 Star or Better? In a perfect world all roads would be 5-Star (i.e. 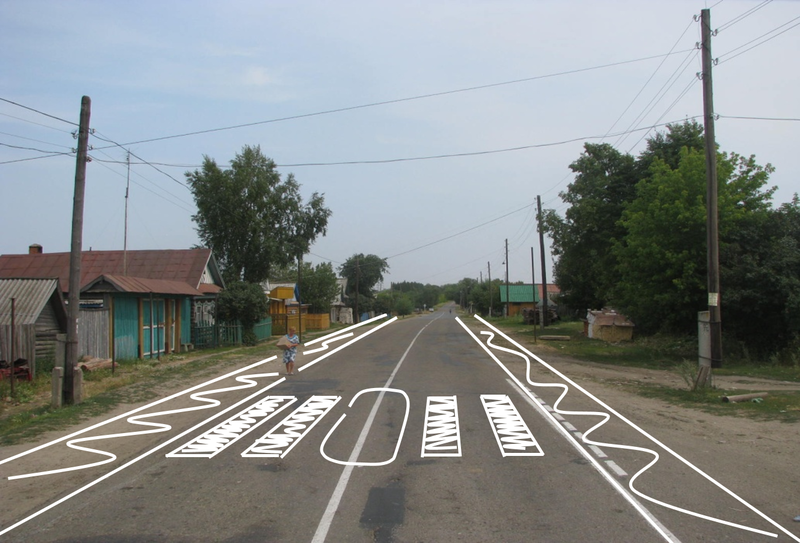 the safest roads) for all groups of road users. 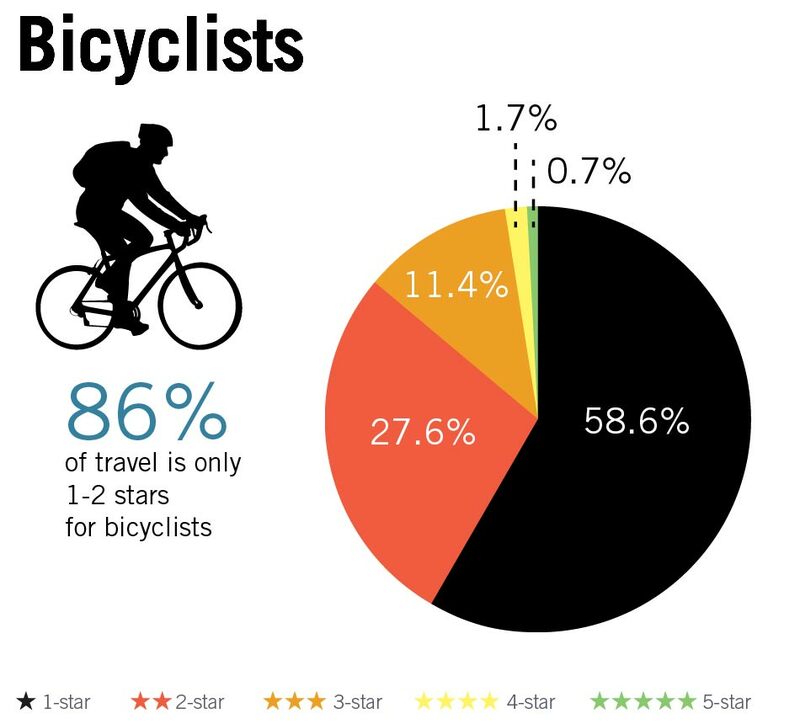 5-star for pedestrians, 5-star for cyclists; 5-star for motorcyclists and 5-star for vehicle and public transport occupants. Although there is an overwhelming financial case for investing in safer roads a 5-Star world for all people on all roads will remain as an aspiration for the future. While high-volume roads can cost-effectively be raised to a 5-star level, 3-Star or better roads for all road users presents a realistic target for national and regional governments and road authorities to adopt. 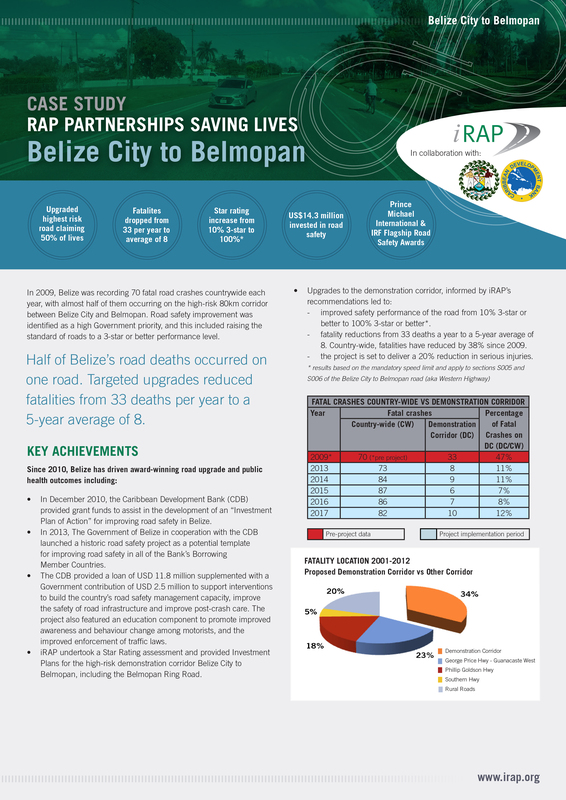 As part of an overall Safe System approach, iRAP believes that a 3-star or better world will help to meet the UN Strategic Development Goal 3.6 of halving road deaths and serious injuries by 2020. Infrastructure upgrades and speed management are the most effective ways to achieve 3-star or better roads for all road users. When investment is not readily available, or is restricted, dramatic improvements can be achieved by a mix of low-cost infrastructure options such as line markings and reductions in speed on the most hazardous sections of the road. 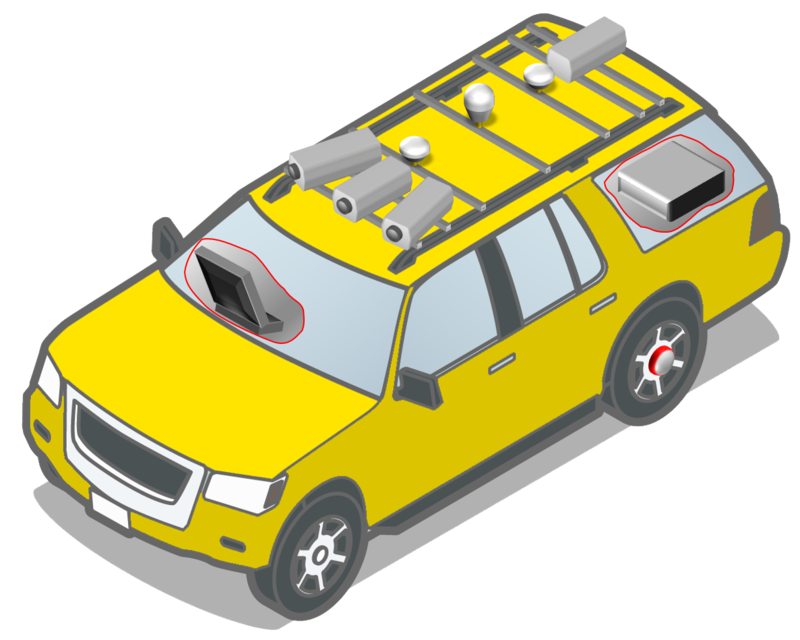 The safety performance of roads can now be measured and managed. 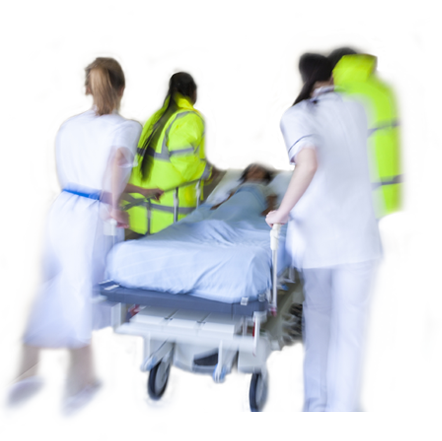 Death and injury rates are typically halved for each incremental improvement in star rating . Bringing our roads to 3-star or better standard will save lives! 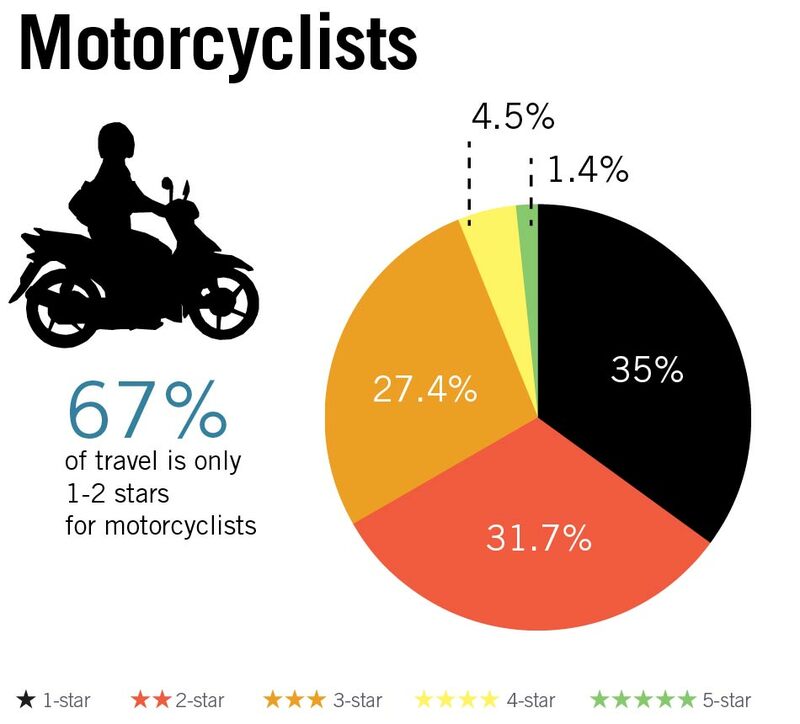 Star Ratings are based on road inspection data and provide a simple and objective measure of the level of safety which is ‘built-in’ to the road for vehicle occupants, motorcyclists, bicyclists and pedestrians. Five-star roads are the safest while one-star roads are the least safe. Broadly speaking, every extra star rating results in a halving of crash cost in terms of the number of people who are killed and seriously injured. Importantly, Star Ratings can be completed worldwide, in urban and rural areas and without reference to detailed crash data, which is often unavailable in low-income and middle-income countries, or is sparse in high-performing high-income countries striving for vision zero outcomes. Where do you want to go with your 3-star or better target? View Case Studies from around the world. Who do you think is most at risk on your roads and where? 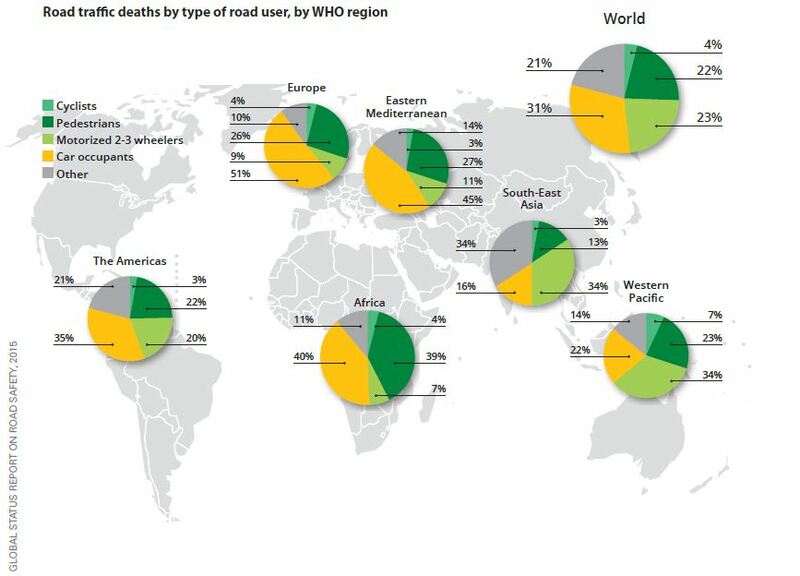 The World Health Organisation Global Status Report for Road Safety provides a country by country overview of road safety performance, the scale of death and injury and the road users typically killed or injured. More than half of all road deaths typically happen on less than 10% of roads in a country. Targeting these high-risk road sections with focussed targets for each road user is a great place to start. 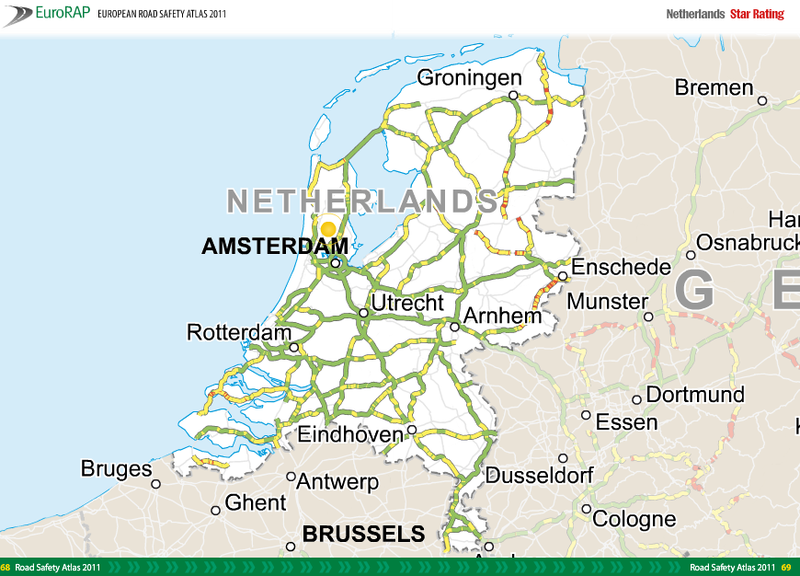 Some countries produce regularly updated risk maps which give a valuable overview of the most dangerous roads. Risk maps provide a visual presentation of the fatality and serious injury risk per kilometre and per kilometre travelled based on historical crash data. 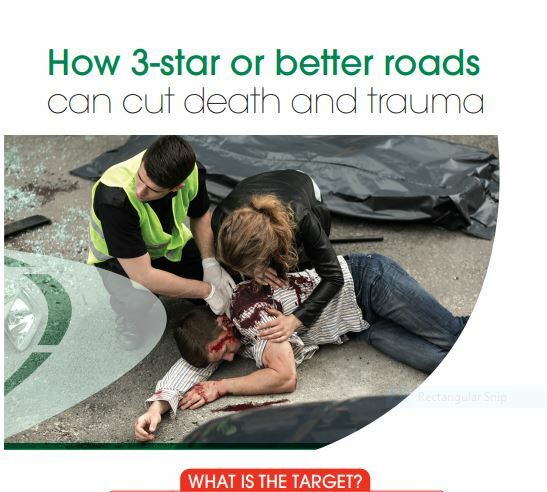 Improving the star rating on these roads where large numbers are killed and injured provides an immediate focus for star rating policy targets and investment to save lives. In many cases raising high-volume, high-risk roads from 3-star to 4 or 5-star may provide the greatest return on investment. 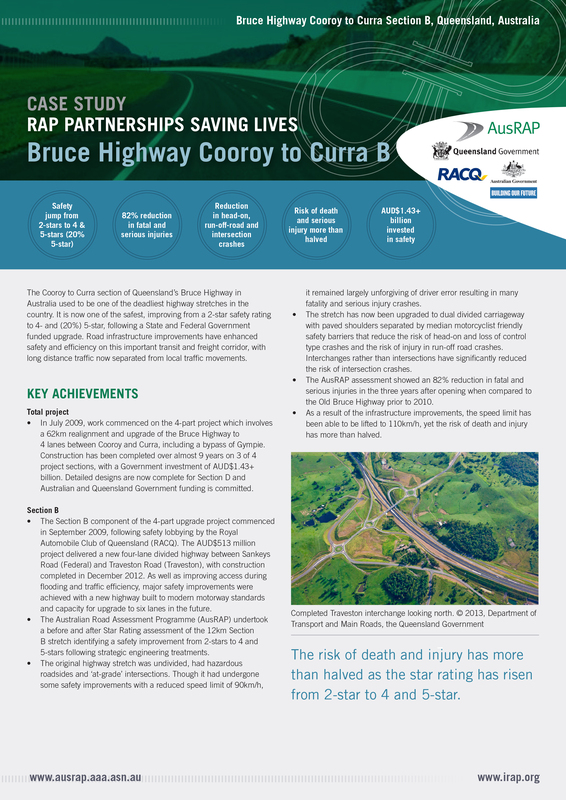 iRAP encourages partners to set targets that ultimately maximise the lives saved within appropriately large budgets - and set minimum 3-star targets for all new projects and road upgrades. 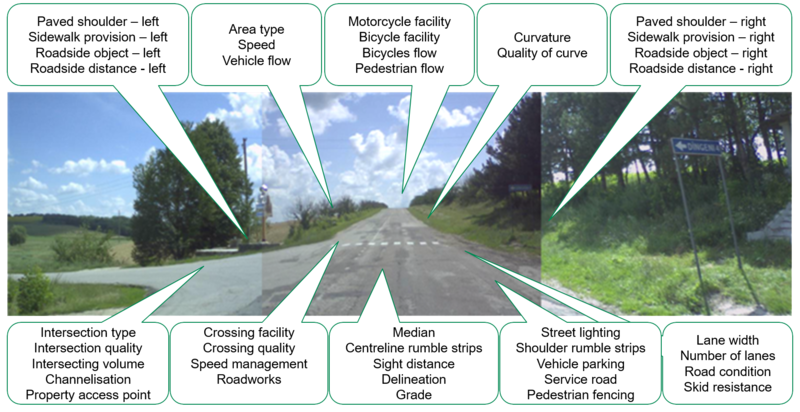 A Star Rating analysis assesses the physical condition of road infrastructure and based on evidence-based research a star rating for all road users is produced. 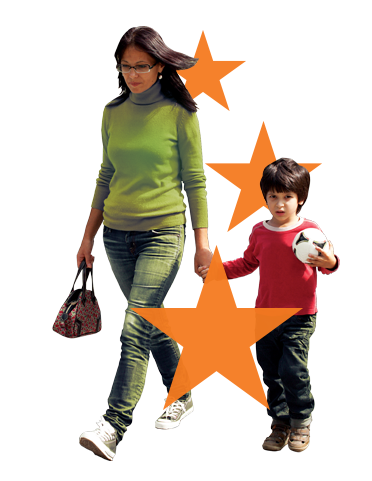 The star rating takes into account the specific road attributes that impact safety for the individual road user groups (pedestrians, cyclists, motorcyclists and vehicle occupants). Identifying the network to be targeted and undertaking a base-line survey is a great place to start. With knowledge of the existing performance of the road network, appropriate targets and investment levels can be explored to ensure an informed and achievable target. iRAP recommends the highest volume 10% of roads is assessed in each country - noting volumes of each relevant road user group as required (e.g. high-volume pedestrian precincts; cycling or motorcycling routes). Leading road agencies have experience in setting star rating targets and the common approach now is to set a target for existing roads in terms of the percentage of travel at 3-star or better. This encourages a sensible focus initially on the higher volume roads for each road user group. For all new roads, no one can afford for a new one or two star to be built. Minimum 3-star targets are the starting point, and standards should be raised to 4 and 5-star where the investment return is high or ambitions are high. 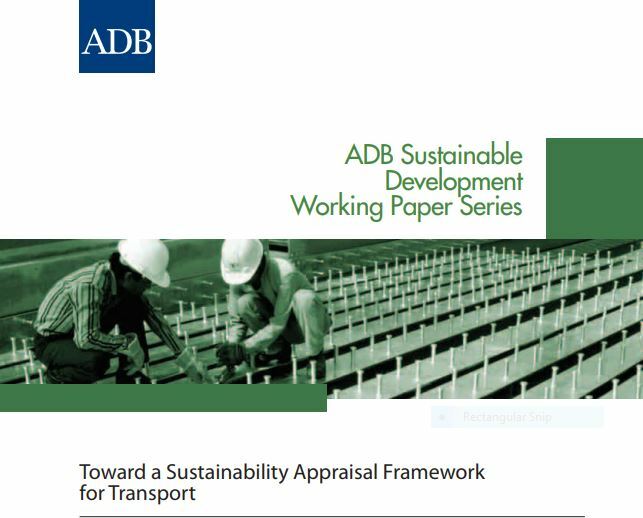 The UN Secretary General's report (A/370/86 - September 2015) recommends that member states should "improve infrastructure, including by targeting the highest volume 10% of existing roads and set appropriate infrastructure star rating targets for all relevant road users and adopting minimum three-star standards and road safety audits for all new road construction"
Use our 3-star or better resources to support your local leadership or advocacy to adopt a 3-star or better target. If you need local language versions please let us know and we will help you. Competitive tendering means that road builders sometimes say they “can’t afford to build safer roads” or that the road is safe as it has been “designed in accordance with the standards”. New roads are often mistakenly assumed automatically to be safer roads. In fact we know that new roads are still being built to a less than 3-star or better standard effectively locking in high levels of road deaths long into the future. You can counter this argument with hard statistics that show that 3-star or better roads make sound financial sense. For each star rating improvement crash costs on roads are typically halved. 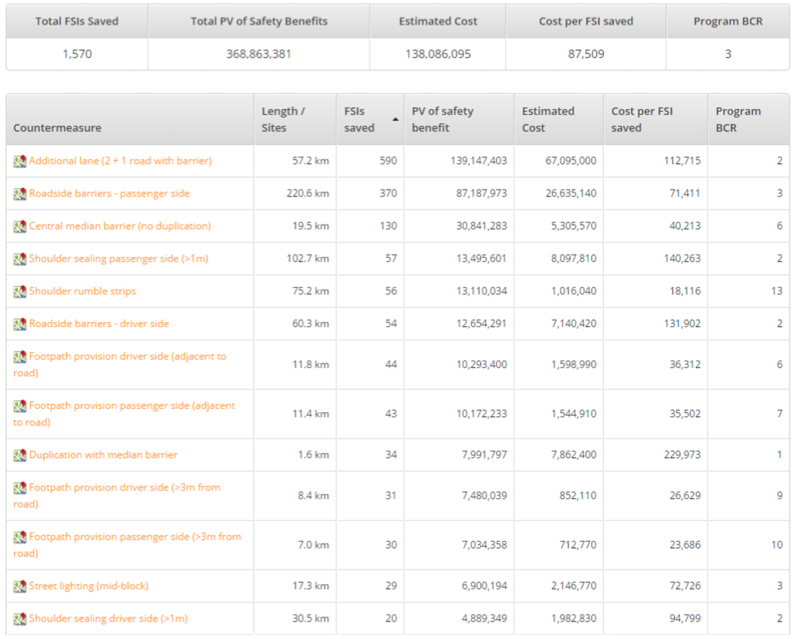 The road safety 'extras' are often a small (<5%) proportion of the total road project, with returns of investment 5-10 times or more the cost of the additions. 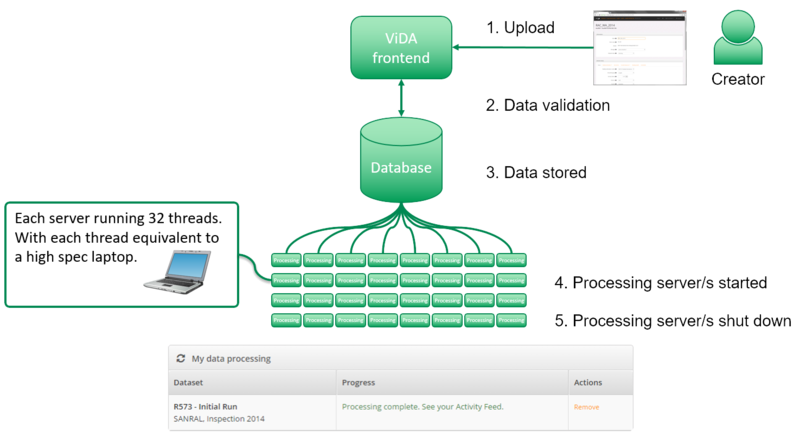 How do I add a 3-star or better target in my project specification? 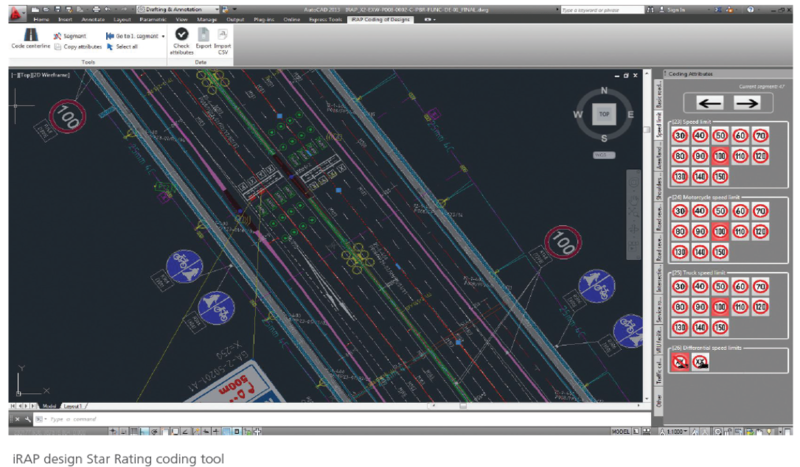 NEWS ALERT: A New Star Rating for Design (SR4D) tool set to revolutionise road design safety was launched in November 2018. Read more here. 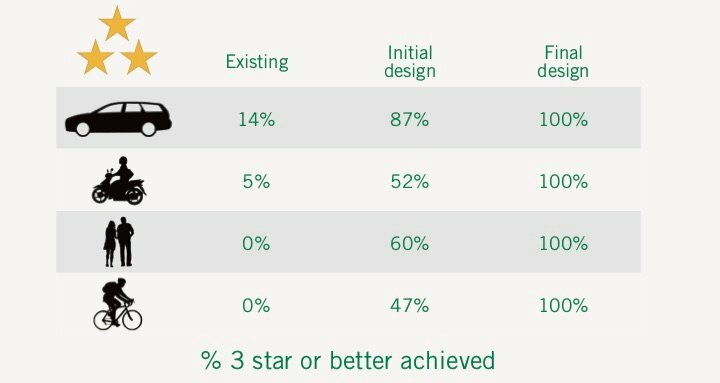 Including star-rating targets in the tender process raises the competitive bar among design teams. The open-ended ‘or better’ target invites designers to aspire to higher performance. A 4.5 star outcome can be given more weighting than a 3.5 star outcome for a very small percentage of the overall project costs. Project evaluation criteria can therefore include the safety performance of a road in addition to traditional criteria like cost, time and quality. The star ratings and associated estimate of life-time crash costs associated with each design can provide an objective, evidence based, global standard that can be used in evaluation criteria. Refer to our simple tables below as a template for action. From a whole of government perspective, and for commissioning bodies making a long-term investment in roads and subsequent infrastructure maintenance, there is a powerful argument to pay for better and safer infrastructure at the outset instead of retrofitting at greater cost in coming years. Safer roads will pay for themselves! Find out more information by clicking on the icons below. The Star Rating for Designs (SR4D) web app is being developed with the aim of enabling Star Rating to be easily incorporated into the road design process. The app will empower designers to assess the road safety of a design and improve its safety star rating before the road is constructed, thus saving lives and preventing serious injury from the outset. Star rating of designs can be incorporated as part of a road safety audit or completed independently. 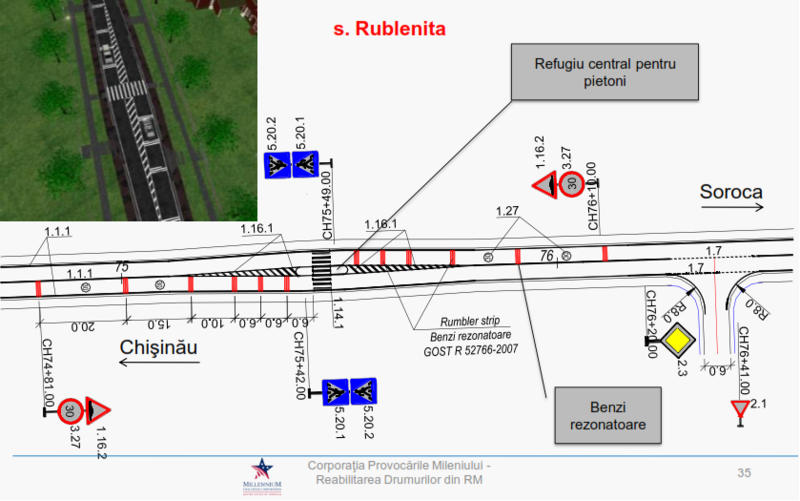 The design drawings together with other key project fundamentals such as expected traffic volumes and speed estimates can ensure the star rating of a design can be completed from the desk-top with local knowledge. Road safety auditors are well placed with the skills needed to star rate designs. Star Ratings are now being used by many agencies to ensure that safety is built-in to designs for upgrades and new roads prior to construction. By providing a means of objectively measuring the impact on risk of various design iterations, the Star Rating design process helps to harness the potential of designers to find creative solutions to challenging safety problems. 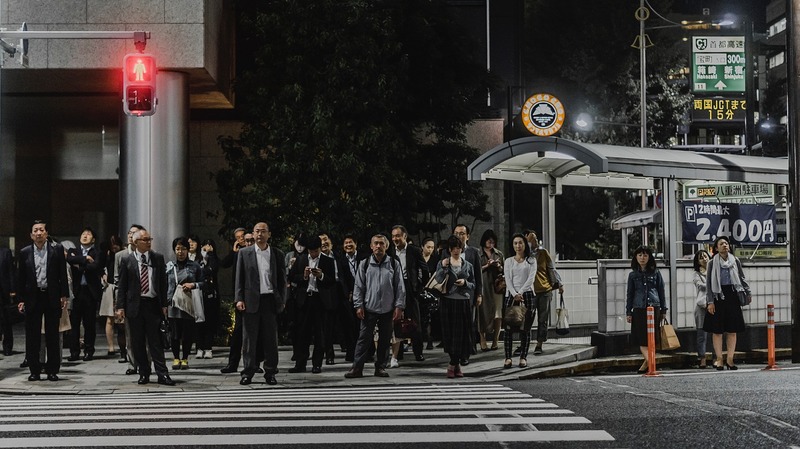 For governments and development banks, the process opens the opportunity to set performance-based targets for vehicle occupants, motorcyclists, pedestrians and bicyclists that not only improve safety but create a high level of transparency and accountability. The Star Rating design process has been successfully used in countries such as Australia, New Zealand, Moldova, Qatar and India, in conjunction with existing mechanisms such as Road Safety Audits and highway design standards. iRAP has developed standard specifications to undertake a Star Rating of a Design that can be included in your project and a trusted network of trained Design Star Rating suppliers around the world is also available. 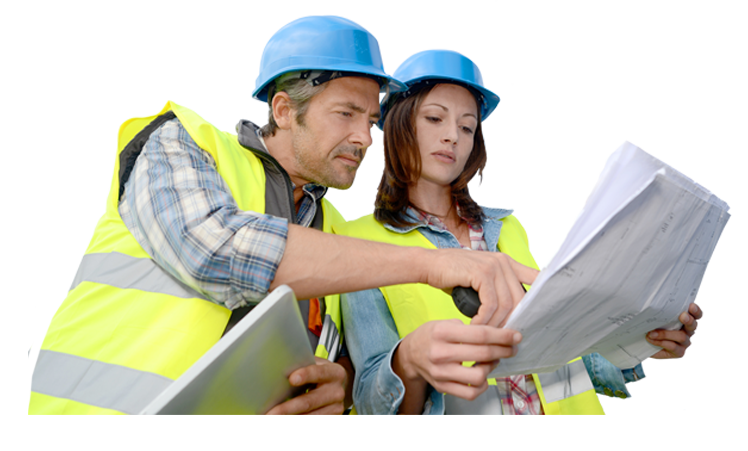 If you need help iRAP can assist in the direct planning and procurement for a star rating of designs assessment. If the 3-star or better improvements are to be effective and credible the improved roads must deliver the promised results. Poor comprehension of design elements, lack of appreciation of road safety features by construction teams, rushed deadlines and the use of inferior materials can all compromise standards. Star Rating the completed project ensures that all the improvements in the design or Safer Roads Investment Plan have been properly completed. It identifies any material changes since the original design was created and possible modifications to the design during construction. Final payment can be contingent on the achievement of the finished star rating as approved during the design or procurement stage. 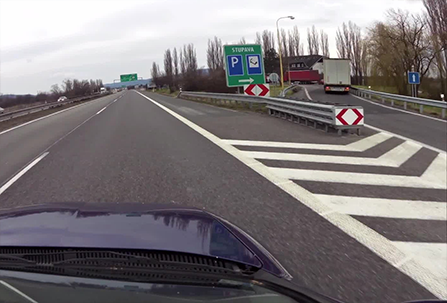 In February 2016, teams in Slovakia reassessed 327KM of the DI and DZ Motorways and R1 Expressway that had been subject to a €40m improvement package implemented by the Slovak National Motorway Company. 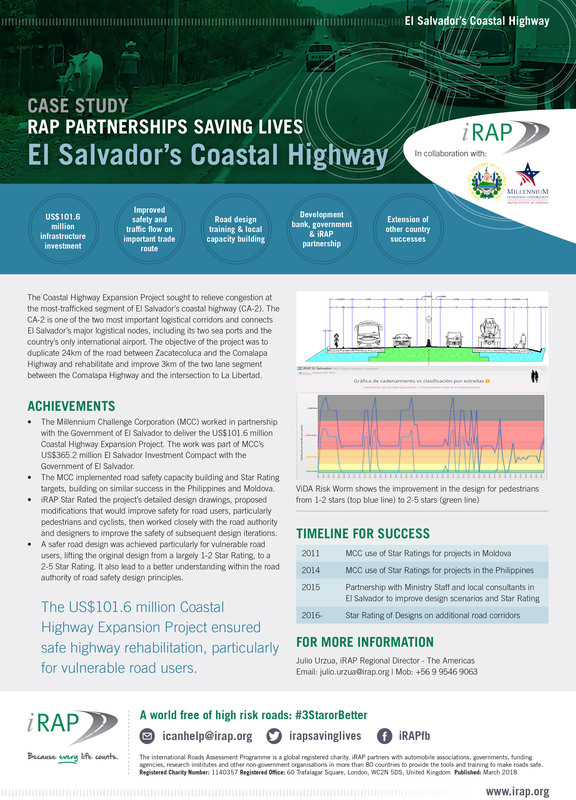 The improvements took place following an iRAP Star Rating assessment undertaken in December 2013 as part of the South Eastern Neighbourhood Safe Routes (SENSoRj) project. 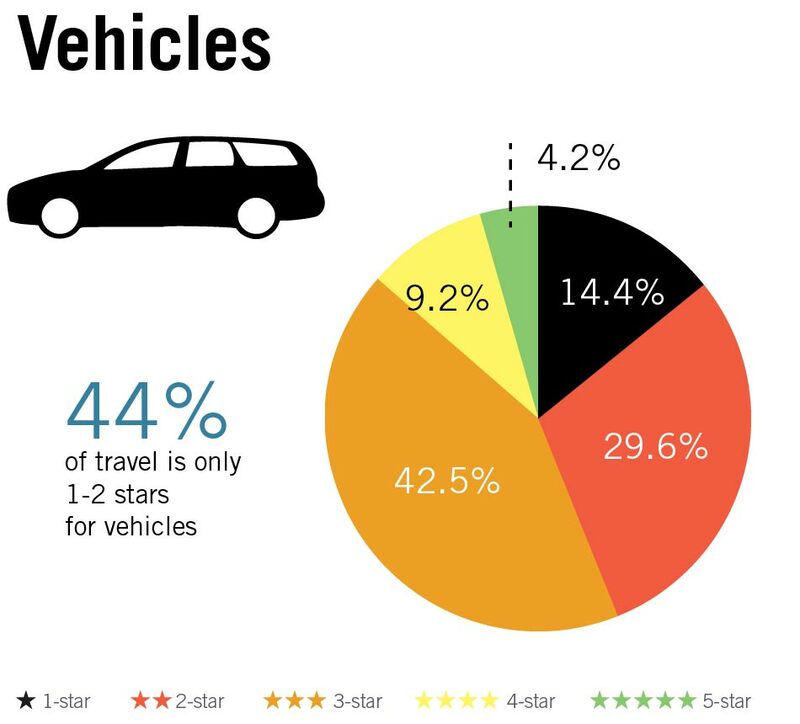 Before the upgrade only 27% of the roads had rated 3-star or better for vehicle occupants. The reassessment found that 77% of the improved sections now rated 3-star or better with no 1- star sections anywhere. It is estimated that over the next 20 years, 355 deaths and serious injuries will be prevented on these stretches of roads. Even when a road is confirmed as 3-star or better we can’t afford to relax. Changing patterns in traffic volumes, urban density and urban boundaries and wear and tear/misuse of infrastructure could mean a road will become less safe over time. It is essential that crash performance on improved roads is regularly monitored. 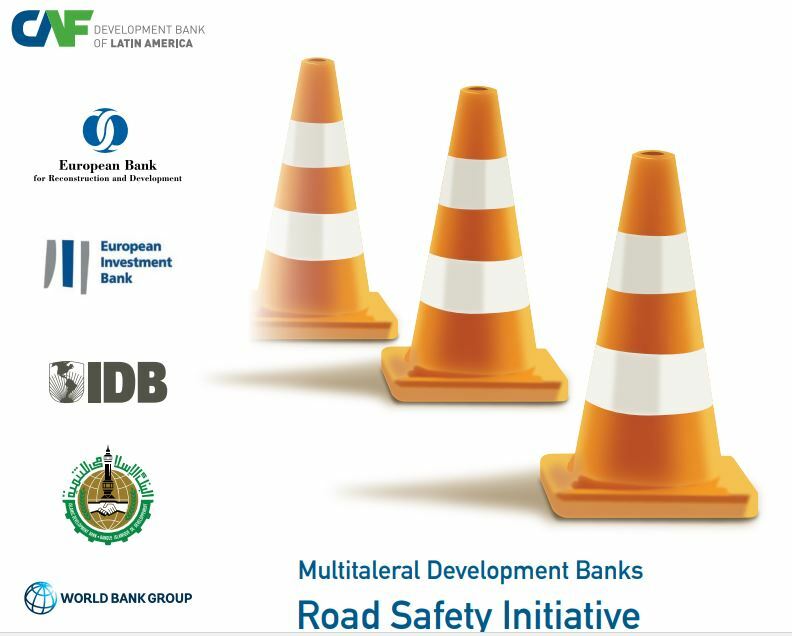 Regularly updated risk maps can be used to measure and report on the road safety outcomes of investment by governments and funding agencies. Before and after studies also help build the evidence base for future investment and can ultimately be shared in the iRAP Toolkit. If risk maps aren’t available, then a Star Ratings reassessment should be undertaken every 3-5 years to ensure performance is maintained. Because road environments – and the communities they serve – are constantly in transition, a road’s 3-star rating may be invalidated by changing circumstances. For instance, in a rural area, an 80km/h or 50mph undivided road with wide centrelines and safe roadsides may deliver a 3-star better road. If the environment served by the road is subsequently urbanised then the safety needs and performance will change. This common problem is a source of many deaths and injuries. In this scenario, with greatly increased traffic volumes at intersections, the former 3-star or better road will now be 1 or 2 star for all new road users. For the road to be safe, in this new urban environment, it will need to be divided and it will require pedestrian footpaths and safe crossings. The speed limit will also need to be reduced. All these changes need to be introduced before the new, more dangerous road environment begins to claim lives. Saving lives should be celebrated. We need to change the public perception around road traffic crashes so they are seen as a major preventable cause of death in the same way as maternal health and insanitary water. To do this, we need your support. We need you to shout about your successes and build positive publicity around them. Get local MPs, design teams, project owners and road safety practitioners along for ribbon-cutting ceremonies. "Minister opens brand new 4-star road" could become a common headline in regional newspapers and media. A powerful speech by a key political figure can be inspirational for other road safety advocates. Listen to this speech by Malaysia’s minister of transport, Liow Tiong Lai. Q: What is the difference between a child’s life saved through vaccination, or as a result of safer roads? Yet, while medical campaigns get well deserved publicity for their successes, life-saving road safety interventions struggle to get the same prominence. When your 3-star or better roads are opened, why not publicise the life-saving benefits of the roads? Submit your “Share your Life-Saving Success” case study here so we can share it with the world and help to inspire the next project that will save even more lives.